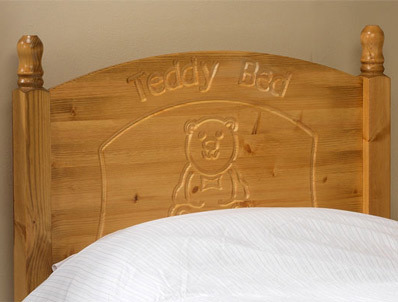 The Friendship Mill Teddy Bear bed is made in britain from imported Scandinavian pine timber as it is stronger than south american pine supplied from the far east. The Bed comes as standard with 1 bed guard but you can add on another guard rail as seen in picture which can fit on the other side of the bed frame .The bed is pictured with a pair of drawers underneath these are available as a add on and are priced at £85 per pair. The Teddy Bear bed is available in 2.6ft (small single) or 90cm wide (3ft) standard single and is supplied flat packed for home self assembly. 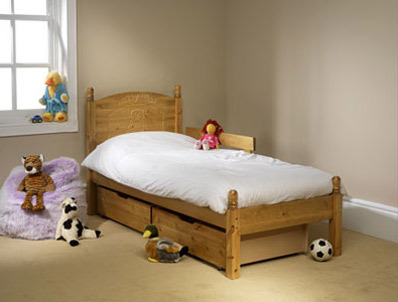 A mattress is not included but frame will take a standard UK size mattress. We would recommend the Sleepshaper Memory pocket 1000 mattress which is 20cm deep at £159 or a Relaxsan Moon foam mattress which is 15cm deep and available in soft or firm at £99 . The frame will be sent direct to you by Friendship mill , the mattress can be added if required on a next day delivery service by parcel force if required.